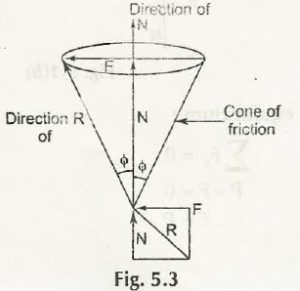 This cone of friction is best known as right circular cone. There is a vertex created when two surfaces are joined in one point. N is the axis which will be directed in normal reaction. Here is a semi-vertical angle which is similar to an angle of friction. 2ϕ will be placed as the Vertical angle of the cone.